We finally got back on the diamond! Taking on Princeton on their b-e-a-utiful campus for a 9 inning bout. What a game it was, a 9 inning scheduled game turned into a 13 inning 5-4 dramatic win for YCP! Josh Brown was on the bump mowing down 8 hitters letting up only one run in 4 innings of work. The bats were asleep for most of the game as we went down one in the third inning. Princeton kept YCP's offense in check with their change of pace pitching. Getting a big run in the 6th inning from Brian Serviss YCP tied it up heading into the last innings. Princeton answered with a three spot on the board putting them up 4-1 going into the 7th. YCP eventually answered with our own three spot tying it up 4-4 heading to the 9th. With solid outings in the late innings from Dan Jones and Andrew Aquilia YCP held Princeton to a big goose egg for the 4 extra innings! A rally in the top of the 13th with a series of walks gave YCP the lead into the 13th. Robbie Engel no stranger to pressure came in the last two innings getting out of bases loaded jams in the 12th and 13th to pick up his first win of the season! A great win against a DI Ivy league school. Chalk it up boys! YCP Club Baseball Green Team is now 1-1-1 on the year. When you simply ask a baseball player what position do you play or why do you even play the game, you won't get a simple one word response; the response that you will receive is long and complex. When I am asked what position I play, you will rarely hear me say, "oh I just play outfield," I will say "I can play anywhere you want me to except for first base and pitcher." Whatever the coach wants and needs, I will be there to help out in any way shape or form. That is what a real baseball player is, one who will go out of his way to make sure his team wins and that each and every one of his teammates succeeds and stays involved in the game. Why do I play this game, someone might ask me. I play for the glory, I play to succeed, I play for each and every one of my teammates who is sitting on the bench, fielding ground balls and pop fly's, and those waiting in the bullpen. I play for the people around me but I also play for myself. There will be errors, there will be strikeouts, and there will be heartbreak; but one thing that baseball can guarantee that a woman and money can't, is that it will be there tomorrow and the next day after. Baseball is the spouse that is always there and is always awake when you come home after a long day in school or at work. It waits in clear daylight and is always there to relieve stress and make a man smile even on his worst days. 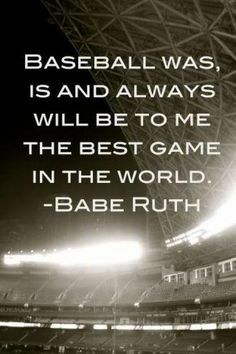 There is a reason that this beautiful game is our nation's pastime, there is a reason that we were all brought up playing tee-ball, little league, high school, and now club; it was instilled in us since birth that we would all love this game and never turn our backs on it when it never let us down. We are one unit who shares a passion and love for a maybe not so simple game and we will always be grateful for it. When we look back when we are 40 and 50 and so on, we will remember each and every single moment of our baseball careers, our highlights and even our downfalls. For me, a moment that will forever be engraved in my memory is senior year state semifinals against Reading Catholic, I go 3 for 3 in a losing effort and just like that I thought my baseball career was over. I spend two years at York College waiting for another opportunity. Entering my Junior Year, it happened, a sign that my career was not over and I am grateful. I know that many more that are on the York College Club Baseball Team felt the same way and that is why we play the game. The Spring semester of the 2013-2014 academic year for the York College Club Baseball team appears to be quite promising for the young and energetic team. New players have been added to the roster and the team is getting younger and younger, and is able to foster talent across the board from Freshmen to Seniors. We have added some young talent who can easily produce at high levels such as newly added Freshman: Louie Venuti, Mike Croskey, Andrew Cosa, and Ryan Sweeney. Each one who have large amounts of talent and potential. 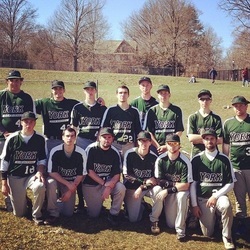 With one season already in the books, the York College Club Baseball team is set on improving its previous record as well as competing with teams that are in the NCBA from the East Coast. 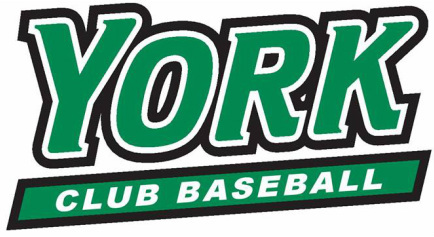 The York College Club Baseball team has divided its membership into two teams: Green and White, and both will actively compete on differing schedules. Upcoming games for the Green team include: Loyola University, Mount St. Mary's, Princeton University, Johns Hopkins University, and Rutgers University. The upcoming games for the White team include: Villanova University, LaSalle University, American University, Bloomsburg University, and TCNJ. Taylor, Louie Venuti, and Will Wallace. The lineups for each team are not set in stone but each team is expected to play competitively and will turn some heads. From what I have seen at practice and around campus, the guys are meshing well both as teammates and friends. During practice, players are producing, getting quality cuts in at the cage, pitchers are throwing gas and many of the players are versatile and can play more than one position. Underclassmen that I believe will have a break out season include Nolan Boushell, Dave Anderson, Mike Croskey, and Louie Venuti. From what I have seen, these players are developing well and are playing to their full potential. All that separates these players between their projected production is time. No matter what, every single player on this team will play great and I expect a lot out of each and every one of the players. This season is going to be great and the wait for game day gets smaller by the minute every day. Thank God, it's baseball season.